Pharmaceutical and Biotech industries must be confident that their systems maintain the high-purity level necessary to meet stringent requirements. Hygiene and safety are the number one concern. That’s why we have developed custom solutions that are carefully designed for pharmaceutical and bio-tech industries. We choose our raw materials to ensure safety. Our finished product ensures purity and ease of use. Clients choose use for standard components like process tank They also come to us when the project is more complex, including individual products like a certified frame or structure or to develop a larger project. 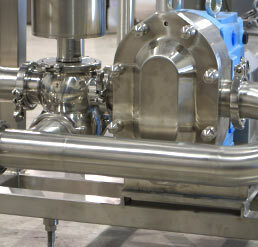 We also develop completely engineered skidded process systems for applications specific to your process. Together with our trusted partners, we deliver complex systems that are tightly integrated, well documented and built to the extremely high tolerances required for highly sensitive processes. Our professional pipefitters are well trained, certified and have many years of experience. Being certified to weld stainless pipe to ASME standards under TSSA positions Advanced Stainless as a preferred choice when it comes to building skidded process systems in our facility or onsite process piping installations. Together with our partner TIG Stainless we are able to provide as many as 4 AMI welding machines with experienced operators, to accommodate large process piping projects. We choose to partner with TIG Stainless because they are a world leader in high purity applications. Through their partnership, we are able to provide the stringent requirements for documentation and validation.